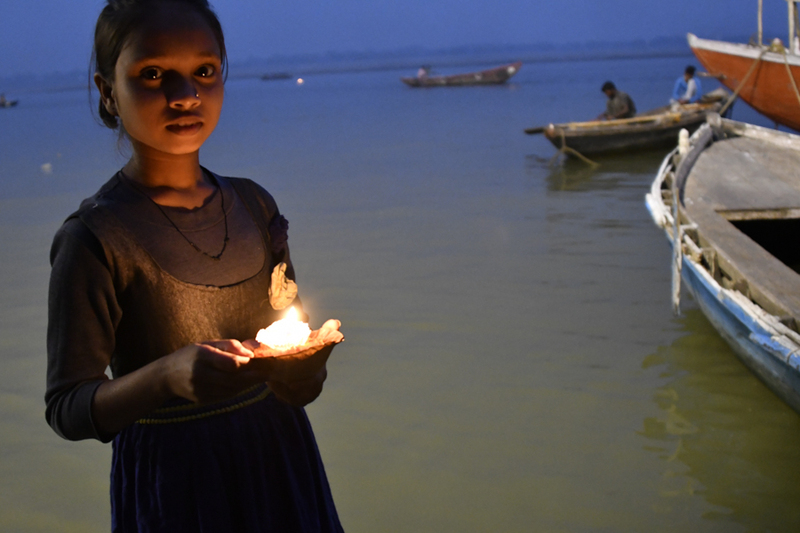 Every dawn and dusk thousands of pilgrims travel to the Ganges and perform the Ganga Aarti ceremony; making a wish, lighting a candle, and setting it afloat on the river. One of my wishes – to align my life and photography in a more balanced way. How? A surprising example may be this story of the photo I didn’t take. Hindu girl selling small candles inside a cup of leaves and flowers. The Sadhu was striking in appearance – white long hair, golden robe, radient weathered face and sinuous body. Something about the way he walked, held his head, and his calm eyes was different than the other Sadhus I’d encountered, too many eager to ask for a donation to pose for a photo. And it was obvious that I was in search of photographs, walking the ghats with two cameras around my shoulders, my eyes scanning the scene for images. 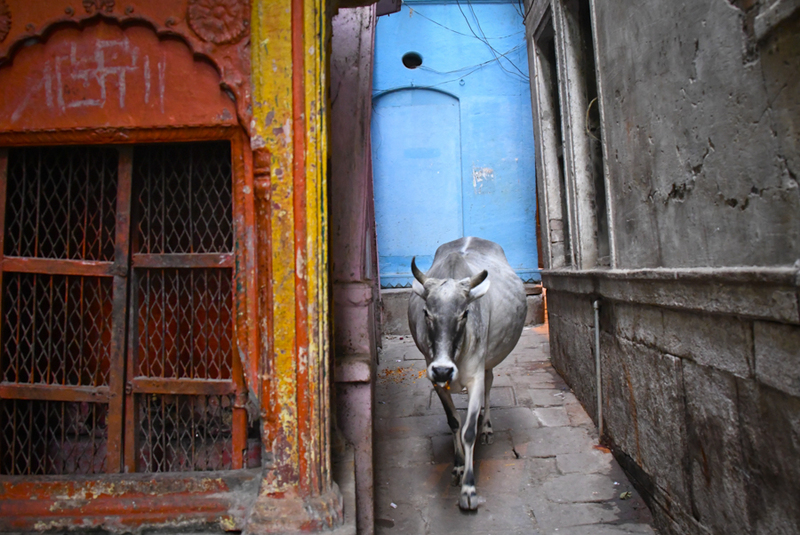 As our paths converged in a relatively quiet area, where perfect morning light softly lit the colorful, graphic stairs of the ghat, we glanced at each other as we passed. I think we both took each other by surprise – that I didn’t raise my camera to take his photo, and that he didn’t stretch his hand out for a donation. I turned around to glance at the Sadhu one more time, and he turned simultaneously. He paused, the slightest gesture of his head communicated that he was inquisitive, possibly even open to being photographed and certainly curious that I hadn’t asked or tried to candidly captured the moment. But I was tired of the superficial transaction I knew taking a quick photo would be, briefly regretting that I couldn’t linger here for days. For awhile I’ve been focusing more on capturing the perfect photo than the experience. Now I was searching for something more. In this circumstance, by not taking a photo I was able to connect – if only for a moment – authentically with him as a person. In the holiest of all places for Hindus, I had to believe there were still some things sacred. I smiled at him, did a slight bow and brought my hands to prayer as a sign of Namaste in greeting , and he graced me with his smile. 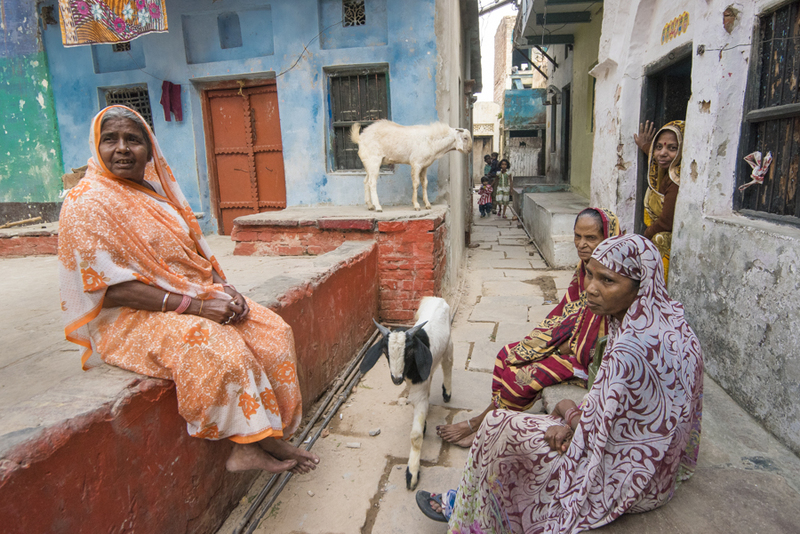 He was indeed a “real” Sadhu, and this may be the most memorable experiences I had in India. The bustle in one of the world’s oldest cities, Varanassi, is never ending and can be simultaneously wonderful and overwhelming to the senses. 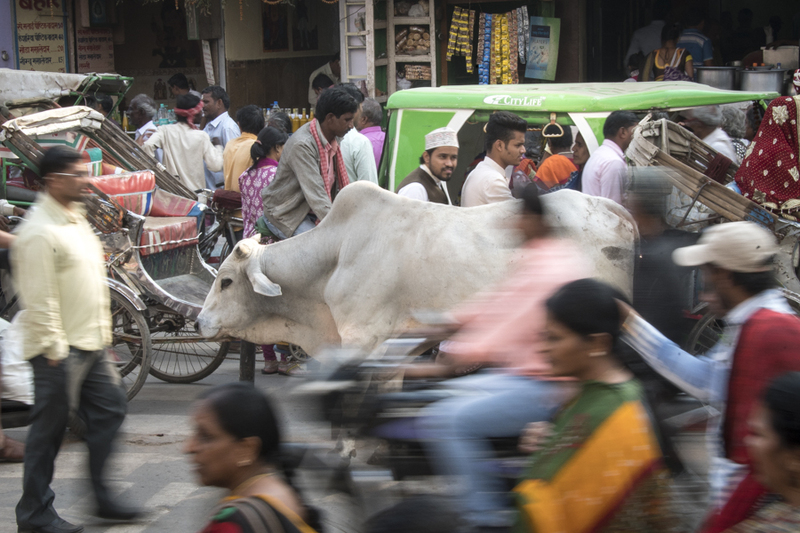 This photo of the cow serenely standing in the middle of the road with traffic buzzing by on both sides exemplifies the spirit of India to me, the ability to maintain calm in chaos, and the importance of finding your own center balance to adapt to the environment yet stay steady.